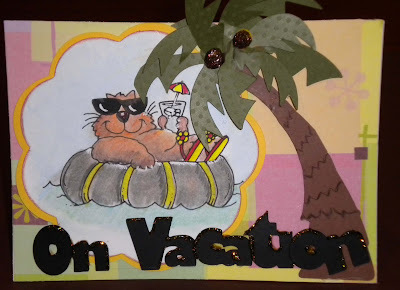 CardMonkey's Paper Jungle: July = Vacation! During the first week of July, the manufacturing plant where I work (day job = bills paid) closes for annual maintenance. It's a forced vacation, and a time to catch some rays as well as refresh my creativity in the loft. It calls for an easel card to place on my desk. Here it is! To create this card, I used the adorable image of the relaxin' cat from Hambo Stamps. This image of the "Cool Cat" is actually a FREE digi-image that you can download by clicking HERE. I've purchased many of the Hambo Stamp images as I think they are totally adorable! For this image, I colored it using a combination of colored pencils with gamosol technique to blend, Copic Markers, and a white accent pen. I cut the image from my white drawing paper using Cricut's Accent Essentials cartridge (the cloud shape, on shadow, using the "Center Point" feature), and cut a yellow highlight piece slightly larger for mounting. I inked the edges, as the white seemed to get lost on the yellow. I then cut a palm tree using Cricut's Summer Vacation cartridge. I cut multiple images, some from brown (for the trunk), some from Bazzill's green for the leaves. I stacked the brown for the trunk to give it dimension, and then cut apart the green leaves and stacked/splayed to give the tree a more realistic feel. I used hot glue to be sure the leaves stayed where I wanted them, quickly. Bling time! I punched through the leaves using my Big Bite CropADile, and placed two brads. The brads I used were yellow, which just looked a little "off" when said and done. So I blinged them with cinnamon-colored Stickles. I created the text "On Vacation" using Sure Cuts A Lot, setting and manipulating the font to make it look more fun. I twisted the last "n", for example, and elongated some of the letters. Then welded, glued and blinged with Stickles. The card design was placed on a small A-frame easel card onto which I glued a fun paper from a summer stack. Hambo's Cool Cat accurately shows what I'll be doing at poolside for the next couple of days. Then I have some writing to do, and some more play too. Enjoy your "cool" days of summer!